Greetings, now that my wife’s finally home rehab-ing after 7 weeks in hospital it looks like I can start something new, although space will preclude completing/photographing the whole scene until we can return to our old place. Following on from past projects this one’s going to push the narrative idea further into new or at least uncommon territory...with some be-shrouding mystery right up to the final reveal in case it all goes pear-shaped. Over a year ago while grappling with the execrable Masterbox Type 170 staff car, Jerry Rutman commented (after I’d shot it full of holes) that it looked like the kind of vehicle Reinhard Heydrich was attacked in. His Merc was actually a Type 320 but it planted a seed & most of the items for that particular Prague streetscape are on the market although they’ll need converting to varying degrees. It’s likely to be the most expensive folly I’ve done but at least there’s scope for some signature pyro as a grenade’s involved. Operation Anthropoid was the mission in which two Czech agents were parachuted into Czechoslovakia by SOE specifically to assassinate Heydrich. Its aftermath was appalling and raises impossibly difficult questions about resisting tyranny which I’ll likely cover along the way. Reference material/images are good but sometimes I may need some detail-checking by any Czech/Prague members willing to help. I’m aware of the 2016 movie “Anthropoid” and last year’s 75th anniversary re-enactment of the event at the site, but I believe both had inaccuracies – I guess you could say I have a Czech-list... apologies přátelé. I’m hoping ICM make better car kits than M/box - the suspense starts right now as my supplier (BNA) is out of stock/back-ordering. 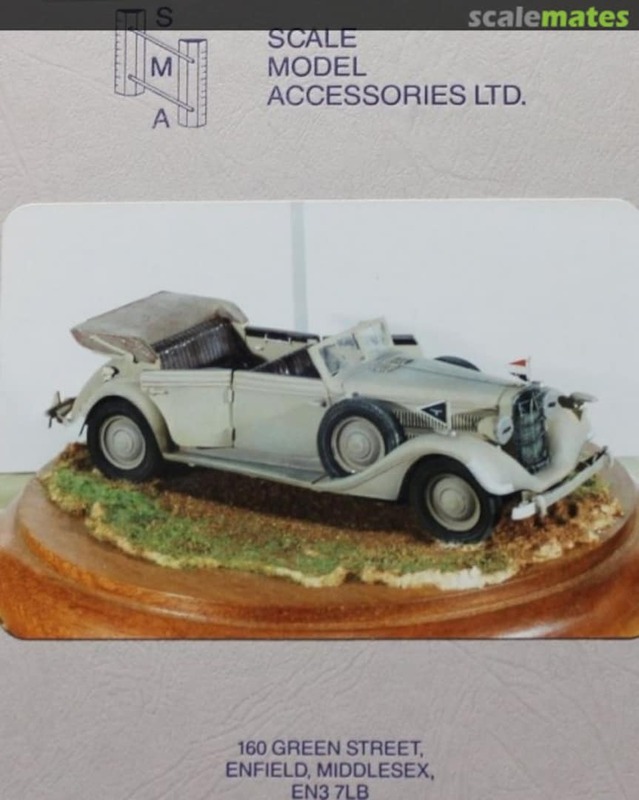 So while I’m waiting, if anyone has information about the Scale Model Accessories kit mentioned above, or if there are any Czech/Prague members out there with local knowledge of Liben as it looked in 1942 (for example were the tramcars really Ferrari-red on that route? ), please let me know. You might wish to check out the 1975 film "Operation Daybreak" which was filmed mostly in Prague at the actual locations; for its time it's actually quite a good film, with the actor Anton Diffring - probably the most typecast Nazi ever - in the role as Heydrich - which he plays superbly. It's quite atmospheric; whether or not it'll help your diorama plans I don't know but the street corner scene is shown and may help. As the Czechs assisted in the film I would hope that the trams, local police uniforms etc are as about as authentic as they can be, or at least for a 1975 effort. As Brian suggests, the film 'Operation Daybreak' (one of my all-time favourites) provides some excellent reference material. I am looking forward to what happens with this one for sure. Very humbling to have my name mentioned at the outset. Thanks buddy. Will we see a standard dio or will there be "enhanced theatrical dioramics" ala Tim ? I’ve contemplated such a thing myself but never get terribly far with it. Didn’t know there was even a 320 kit for a start! I have a recollection that it was dark green rather than black actually. You’re probably aware that the corner where the action took place has been remodelled since so you can’t get any useful info from Google Earth unfortunately. After The Battle mag did a piece about it with info on the original layout and that would be worth acquiring. I visted the National Army Museum in Prague in 2004 where they had a brilliant exhibition on Anthropoid (obviously being in Oz it's more of a journey for you) which is worth visiting. They'd even got Gabcik and Kubis rather shredded and bloodstained clothing there (which I found a bit macabre) and a replica of Heydrichs damaged vehicle. I also visted the church and crypt (St Cyril and Methodius I think) where they eventually holed up and fought their final action. It has a small museum which is very informative despite it's small size. Being on the spot and looking at period photos of the battle there is a strange experience to say thye least. Quite moving as the walls are pockmarked with splinters from grenade fragments and there's a neat line of bulletholes where someone has fired a burst at one of the occupants as they've entered the crypt. I've always found the whole Anthropoid operation fascinating so look forward to watching your build. With only a cursory glance I should think the ICM kit is the way ahead; being in injected plastic it should be easier to modify and work with than the SMA kit which I'm presuming is in resin, although as ever that's a personal choice. This was such a cataclysmic event it almost demands to be done in diorama form; I look forward to following this. Thanks so much guys I really appreciate your support & suggestions, surprise is an understatement as I was inclined to think this subject might er bomb - a pre-flight check on past dioramic attempts came up with zip apart from a toy-town style effort. Brian & Paul – yes I’d looked at “Daybreak” & inclined to think it’s the most useful movie source, partly depending on whether the actual location shots are reliable i.e. was the site re-modelling as mentioned by Robert done post ’75? - which is one reason I’m hoping a Czech member might be able to help out. Re your 2nd post I must admit I’m not exactly keen on tackling that resin/metal kit if one turns up & I suspect it wouldn’t be cheap either. As you say plastic’s just easier to deal with, and having discovered the potential of heavier grades of tin foil recently (GAZ truck/convoy dio) I can hopefully do a decent job. Dan – thanks, those links were what started me thinking the idea might work & be interesting enough, provided I can pull off what’s in my head. Robert – me too re the existence of ICM’s Type 320 until a few weeks ago, and yes I saw a reference to the car being dark green too but I think only in a Wiki article & nowhere else. The Gestapo “crime-scene” photos - Dan has provided the link for a few of them in his 2nd post - indicate to me the car was black (although there’s always room for doubt); the “meticulously restored” original is (if indeed it is the original - room for doubt there too); and all the movies have gone with it too (except we shouldn’t believe everything/anything we see in the movies), but hey unless someone comes up with a convincing counter-argument, black it will be. As for the colour of the resin/metal kit as reproduced above by Frenchy, I’m at a loss. Yep tried Google Earth but I think I’ve got better contemporaneous views – however I’ll check out that ATB mag as it might have some rare ones, many thanks for the tip. Anyone happen to have a copy...? Henri-Pierre – thanks got those sources too, the Daybreak car looks close to the restoration although the former’s got the Notek headlight – correct, except it was further forward on the wing of the real thing. The restoration’s front fender is wrong (“meticulously restored” they said), Daybreak & Atentat have the correct vertical bars on either side of the recessed number-plate section. Talking of details the ICM sedan has external rear door handles but none of the cabrioles do, presumably because in the latter you reached in to use the interior handle...? I foresee all kinds of trouble over the colour of the tilt-cover...and upholstery, & I should start taking bets now for any consensus on which pennants are correct. Karl – great to see you back & hope you’re well. I can well imagine how you felt there I’m sure I’d have been the same. Prague’s always been near the top of my bucket list & not just because of the current subject, so assuming my wife’s doing cartwheels again by the end of this year it’ll hopefully be part of our Grand Tour 2019. ATB no. 24 is the issue you need. Available from www.afterthebattle.com for the modest price of £5. That might be where I got the ‘green’ car but I can’t remember. I’m not at all convinced. Admittedly a lot could have happened to it over 70 years or so but my guess is it was only ever a standard 320. I doubt green's original either unless a Merc expert can say otherwise but perhaps it explains the Wiki entry? As always at the research phase there's a danger of getting wrapped around the axle (no pun intended - or at least not much of one! ); as one of the references pointed out there was more than one vehicle in Heydrich's fleet,but it seems pretty clear to me that the vehicle on that day was black. It would have to be a pretty dark green to appear as dark as it is but I'm happy to be proved wrong, but to be honest, I'd get cracking on the build - aim for black unless in the meantime something overwhelmingly accurate comes to light. Sorry if this appears as a harangue -I'm just keen. As for too much research – well the only firm decision I’ve made so far (apart from the car colour) is to take this extra fact-finding time to make this dio as accurate as possible. No doubt I’ll probably still slip up on something(s) but personally perfection’s the only goal worth going for. This phase has already proved very worthwhile thanks to you guys and besides, I’m waiting for the kit’s delivery so I’d rather twiddle a mouse than my thumbs. If it turns out I can’t make the car look good/accurate enough there’s little point buying or building anything else. Intresting subject,i always like damged tanks,cars ,planes and ships ,so i will be watching your progress. Thinking of Reinhard H ,i would go with an all black car . But the are plenty restored versions with a two tone body Black &dark green or dark blue . Yes that one’s strange, why didn’t they just move the tram? I’ve been comparing the shadows in the nine photos I have & making an assumption they were all taken on the day. If so it looks like the photo of the sten on the sidewalk was taken first because the sun’s overhead. 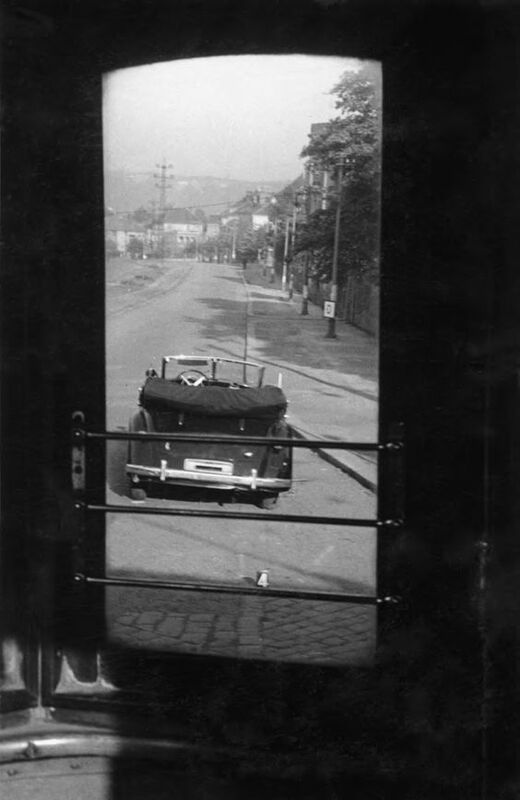 Both doors seem to have been closed (as much as Heydrich’s could be) until mid-afternoon, then the passenger door’s open/half off its hinges for a while (such as in the one I posted yesterday), and then closed again for the later afternoon photos such as in the tram window view above. 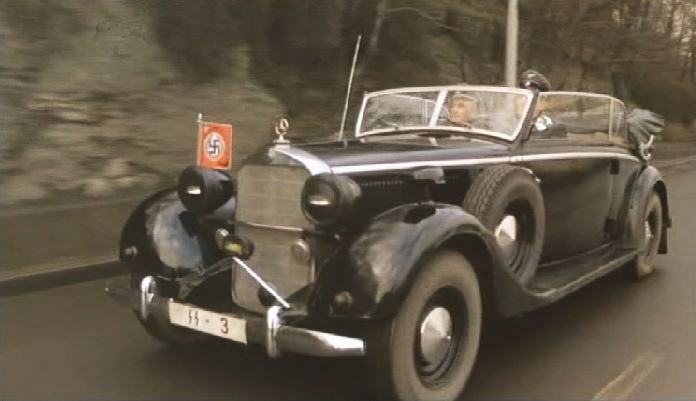 Both windows are up throughout so Heydrich couldn’t have got out without opening the door, and Klein’s door presumably just swung shut after he jumped out. The “4” card on the ground in the above view can be seen in another photo with another nearby - presumably marking either Heydrich’s or Klein’s shell-casings firing at the escaping Kubis on his bike before Klein chased Gabcik forwards and off to the left of the car. The missing number-plates could have more than one explanation – either never there, or removed by the police? More important: I'm excited to see someone building that one up since I have also seen all the places connected to that incident myself (the street corner, the church, the houses where the resistence members lived, the hospital Heydrich died in a few days later, and the very, very depressing site of Lidice the village that was erased after the assassination attempt... After you have seen and learned about that you will really understand why to hate fascism and all its populist revenants... Anyway, will be following closely here! Removed by original poster on 03/15/18 - 11:20:13 (GMT).